Water Wells Alberta | Home | Access Waterwells Inc.
Access Waterwells Inc. constructs reliable residential and commercial water wells for clients across Alberta. Access Waterwells Inc. designs and constructs fresh water wells in Western Canada for new & existing clients across the western provinces. Founded in 1969 and re-branded in 1992, we have been dedicated to client service whether you need a fresh water source well system for your home, commercial water supply for a remote industrial location or maintenance upgrade for a municipal water supply system. We recognize the importance of a rigorous and effective safety program, and our company is SECOR certified, and a member in good standing with ISNetworld and Canadian HSE. Not limited to drilling, we also provide reliable service of existing wells and supporting infrastructures. In addition to our broad range of services, we also sell a variety of surface and submersible products for your well & system. With a range of motors, pumps, stainless steel fittings and electrical controllers, we are fully stocked to serve the needs of your water well system. To speak with us about any type services or to inquire about our products, contact Access Waterwells Inc. today. 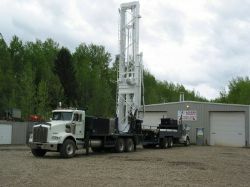 We provide drilling for water wells and exploratory projects as well as service for existing wells and structures. We stock a large range of submersible pumping equipment and related products. Our reputation is built on the foundation of many satisfied clients.